schuetzdesign: I want Kalinda's Notebook! I'm a bit of a fan of 'The Good Wife', but even more of a fan of the orange notebook that Kalinda Sharma always carries. Despite my smart phone, laptop, and iPad Mini, I still like to carry a notebook to take to meetings, jot down to-do lists (and more importantly: tick them off), sketch, take notes and generally use as a record of my business life. I currently use a RHODIA. I like the feel of their paper - they do make one in orange, but I can never find it in stock - so I am stuck with the designers default: black. Orange is kind of my signature colour, So Kalinda's notebook is my point of envy. Moleskin - don't seem to do one in Orange at all. 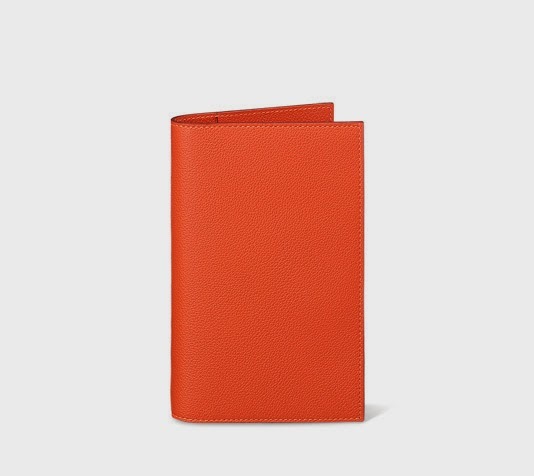 Pinetti do an orange leather cover, but it doesn't look as polished as Kalinda's. I have a sneaking suspicion that it is not a RHODIA, but HERMÉ. In which case, I'm looking at more than AU$600plus $140 for the refill. Anyone know of any other options? UPDATE: I think I just found the prefect Kalinda's notebook! This is the notebook Kalinda carries! Haha! I just discovered the series and have been wondering the same thing myself. Thanks for the link.